Boosting profits alongside your everyday, bread and butter business means doing things a little differently. Like taking a holiday to revive the senses or taking a stroll to break the cycle. Finding quick-fire and longer term ways to add some extra to the bottom line requires some creativity and a blast of energy. It’s often hard to focus ‘on the business’ when you are spending all your time ‘in the business’. Being creative will also have the added benefits of refreshing your drive and giving you much-needed perspective on the business. It’s often hard to focus ‘on the business’ when you are spending all your time ‘in the business’. Trying things, some may not work, is just as important and pushing the little boundaries will show you where the potential is. Scratch some itches. Limited edition. By excluding the mass involvement in something, you are in effect making the product very desirable. Everyone wants what others do not have. This could be a collaboration with a known photographer or an established local business to produce something inexpensive to both parties which is fun and interesting at the same time. Workshops and events. These things require a little investment. Hiring event furniture to create a space on a high-street market. Renting space to host an event. Exhibiting at and event. But the pay-off will deliver on a few levels. By promoting your business as a source of expertise and connecting with the community (on or offline) you are pushing those boundaries of perception and growing yourself. The by-product of this is increased awareness and marketing. All small business needs as much visibility as possible. By interacting with people, you also gain priceless feedback. Stock drives. There will always be stock sitting idle and refreshing that stock will keep the business from going sterile. Get it out of the cupboards and make something exciting that attracts the bargain hunters and fence sitters who have always thought about it but never acted. Both parties will win. Partnerships. Whether online or offline, creating access points for your business that is not your website or studio will drive sales and awareness. See if other businesses are willing to partner and drive business to and from their sales points. You can reciprocate and create vital connections at the same time. 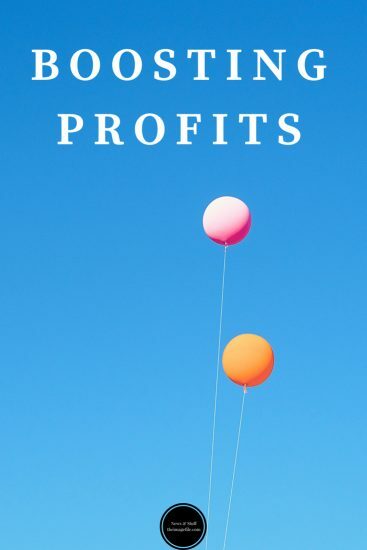 There are other ways of boosting profits that may be construed as negative and these require cutting back, or losing staff or suppliers. There is a positive outcome in terms of cost but important to see the longer-term effect this has on perception of your business and the ability to bring those cuts back which is not always possible when relationships have been severed.